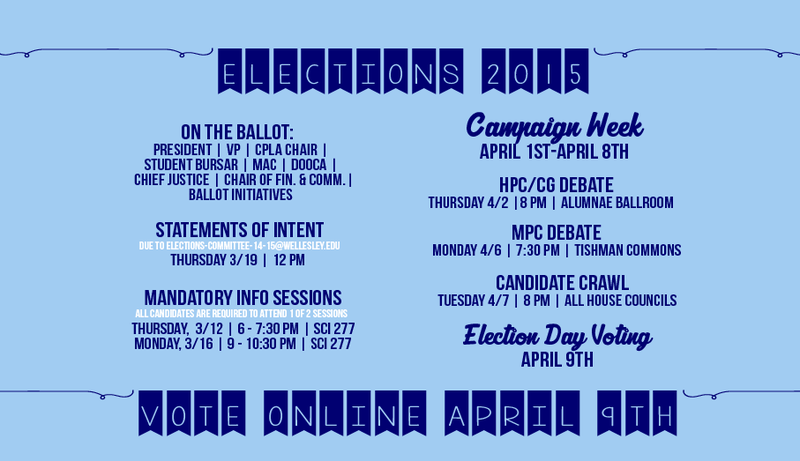 It is always challenging to make College Government Elections smooth, efficient, and accessible for the student body. Consequently, Elections Committee (EC) has changed some aspect of the elections process every year for the past three years. In preparation for this year’s campaign week, which kicks off Apr. 1, EC has been rethinking some key aspects of the process. We believe that these changes will promote open, honest dialogue about candidates and issues, reaffirm a commitment to the Honor Code and attempt to engage and inform the entire student body. Traditionally, the elections process has required a lot from candidates in terms of time and resources. This year, we are taking steps to make the process more manageable by reaching out to student organizations on behalf of candidates to set up visits ahead of time, providing shuttles during Candidate Crawl and consolidating and shortening debates. Last year’s election season featured 5.5 hours of debates — most of them attended by the same people. This year, there will be only two debates: the College Government/House Presidents’ Council Debate on Thursday, Apr. 2 at 8 p.m. in Alumnae Ballroom and the Multicultural Presidents’ Council Debate at 7:30 p.m. on Monday, Apr. 6 in Tishman Commons. Both of these debates will feature targeted questions that relate specifically to the candidate’s position. We encourage all students to participate in these lively, engaging discussions! EC also strongly believes that campaigning should be about ideas. We want candidates to focus primarily on developing a platform, conveying it to the student body, listening to students’ opinions and answering students’ questions. We’ve created multiple avenues for candidates to discuss their ideas and concerns with people who have been through the process: encouraging current Cabinet members to reach out to candidates, setting up an informal lunch with current Cabinet members during campaign week and designating EC point people for each position, who can answer any questions a candidate may have at any point between now and election day. Campaigning should also be accessible — no one should be dissuaded from running for a Cabinet position because of the financial commitment. This year, we are moving for the first time toward publicly funded elections. All candidates and ballot initiative groups will receive a campaign kit. This kit includes everything candidates need to run their campaign: chalk, masking tape, butcher paper, markers and some color printing. If a candidate wishes to turn down the campaign kit, they may spend up to $25 of their own money that will not be reimbursed. The only exceptions to this rule are candidates for College Government President, who receive a campaign kit and may spend up to an additional $25 of their own money. Donations must be taken into account in campaign budgets. Items funded by the College and open to all candidates (e.g. black and white printing) are considered free for everyone’s use and are negligible for financial disclosure. All candidates may use social media and other free platforms to help get their message out to the student body. In past years, the mixed-up minutiae of campaign regulations have created unnecessary confusion for candidates and their supporters. The purpose of Elections Committee is to run elections, not to be a judicial body. At Wellesley, we have a system in place for negotiating actions or behavior unfitting of members of a shared community: the Honor Code. This year’s EC will implement a three-tier system of clear-cut campaign violations, with the Honor Code as the foundation. Tier 1: Violation of existing campus policies, i.e. spamming rules. In a Tier 1 violation, candidates who, for example, place spam in unauthorized locations or chalk vertically will be asked to take it down on their own time and take responsibility for any costs. EC will not take punitive action for Tier 1 violations; they will be enforced by existing College structures. Tier 2: Failure to meet the mandatory requirements of campaign week, i.e. not showing up for a mandatory debate or Candidate Crawl. Tier 2 violations result in removal from the ballot. Tier 3: Misrepresentation of finances or interference with another candidate’s campaign. Tier 3 violations result in removal from the ballot and the filing of an Honor Code charge. “Interference with another candidate’s campaign” includes, but is not limited to, publicly supporting or opposing another candidate, making personal attacks against a candidate, candidates saying who else they are voting for, or candidates “liking” another candidate’s campaign Facebook page or social media posts. Candidates are encouraged to have an unofficial “campaign team,” a small group of friends who can help them prepare for debates, coordinate a campaign strategy, spread the word about their campaigns and provide emotional support. This year, Elections Committee will not be regulating campaign teams, as we hope that every student on this campus will get involved in the process and discuss candidates, platforms and issues in an engaged manner. While EC is not regulating campaign teams, all members of the Wellesley College community remain accountable to the Honor Code. Smear campaigns or other unethical behavior will not be tolerated, whether conducted in person or through anonymous forums. We hope that the community as a whole will join us in condemning any such behavior. EC hopes that the changes we have made this year will provide a sustainable template for future years. We believe that these changes will make elections more exciting and accessible for all Wellesley students. Students interested in receiving updates from Elections Committee should like Wellesley College Elections Committee on Facebook. If you have any questions about campaigning, please feel free to send either of us an email at cgpresident@wellesley.edu or cplachair@wellesley.edu. We’re looking forward to an exciting week!